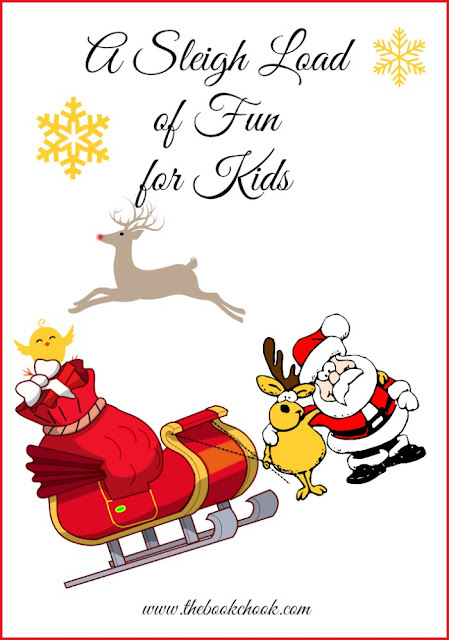 It will soon be that time of year when parents and teachers look for some Christmas fun to include in the learning kids do online. Here are some sites I’ve bookmarked as perhaps being useful to you - some are even educational! While I have tried to choose sites with minimal ads, I make no claims about any websites in this list. The best way to keep kids safe online is to supervise what they do, or play along with them. * Here’s a simple mouse activity from ABCya where kids must drag the mouse to add Christmas lights to a house. * Also from ABCya, a more complicated decorating activity. * For puzzle-loving students, a physics-based logic puzzle called Sugar, Sugar Xmas Special. Draw lines with the mouse to get sugar into cups. And another ABCya physics-based Christmas puzzle, Civiballs Christmas. * Here’s an interactive Math Fact activity with a Christmas theme from ABCya. Practise the four operations at different levels of difficulty. * So much fun! Kids can play Deck the Halls, We Wish You a Merry Christmas and Jingle Bells by honking the appropriate numbered reindeer nose in this zany “Rain” Deer orchestra. * The above image is from a reasonably simple tree-decorating activity requiring the mouse at TESiboard. Kids must drag shapes to a canvas and use them to create and decorate a tree. TESiboard also has an interactive Christmas-themed shape-sorting activity. * NorthPole.com offers a build the snowman activity where kids drag features to decorate a snowman. * Here’s a mad libs-style Christmas-themed story. * Christmas Memory from Smart Kit Puzzle Playground has varying levels of difficulty. * Fun 4 the Brain has an interactive math game called Reindeer Cafe. * This Bell Ringing Game from TESiboard encourages kids to copy a sequence of bells. * Learn English Kids has an interactive activity called Whose Present? where kids need to listen to what Santa says, then make some choices to show they understand. Every teacher, however passionate and dedicated to creative educational outcomes for kids, is thrown into a situation where she/he needs a worksheet. Here are some places to grab something that will keep the troops quiet while you explain your philosophy of teaching to the suddenly-visiting Big Wig. * I have created two fairly simple free PDF counting puzzles which are available at my website. You’re welcome to download either HowMany (pictured, almost monochromatic, above) and/ or HowMany2 (colour, below) if you are a parent, teacher or librarian, who works with kids. * US author/illustrator, Jan Brett, has some lovely PDFs and activities linked to her books. 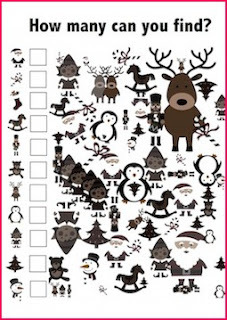 * Here are some write a letter to Santa templates. The same website has Christmas colouring pages, including mandalas and even an Australian Santa! Not even my best friend would call me a crafty person, so I love "simple and foolproof" when doing craft activities with kids. I also have a soft spot for reindeer! * Here’s a tutorial on how to make an Adeerable Reindeer painting at Wolfelicious. * I loved these cute and easy candy cane reindeer. * And more googly eyes - Clothespin Reindeer. 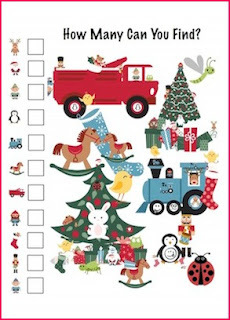 * Check out a list of topics for Christmas Charades and other game ideas. * Great ideas for preschool Christmas-themed games - for class or for parties. You might also like to read The All-singing All-dancing Christmaspalooza Resource Hamper (1), The All-singing All-dancing Christmaspalooza Resource Hamper (2) and The All-singing All-dancing Christmaspalooza Resource Hamper (3).